What do you enjoy doing on vacation? Do you look forward to eating fantastic food? Do you love learning about local traditions and culture? If you answered yes to those, then you need to experience a Door County Fish Boil. These special community events bring everyone together for an evening full of fresh food, music, and good company. A fish boil is a great way to eat locally and attend a unique event. If you are searching for more things to do and places to see in the area, request access to our free Vacation Guide! It’s full of local tips and recommendations on the best activities, events, and places to eat in Door County. What is a Fish Boil? A fish boil is a traditional Scandinavian technique for cooking large amounts of fish. A stainless steel pot is placed over a fire and filled with locally caught whitefish steaks seasoned with salt, potatoes, and onions. Throughout the cooking process, the oil from the fish slowly rises. Before the boil master pulls the pot off, they throw fuel onto the fire, causing the flames to engulf the fish and the water to boil over. A delicious and unforgettable meal follows this picture-worthy moment. The Old Post Office Fish Boil takes place in a restored post office that served the Ephraim community in the early 1900’s. In addition to deliciously prepared whitefish steaks, you’ll be able to choose from a buffet of potatoes, pumpkin bread, cherry pie, and more! The venue also provides stunning waterfront views and indoor seating. Please make sure to make your reservations in advance! The Viking Grill is more than just the site of the original Door County fish boil. Dan Peterson is also one of the only local master boilers to honor the Scandinavian traditions of this treasured event. The restaurant is open for all meals of the day and serves up delicious breakfast selections including Swedish pancakes and corned beef hash. For lunch and dinner, enjoy the grand fish boil display along with some homestyle soups, wrapped sandwiches, and a cold beer or cocktail. Throughout the year, the White Gull Inn hosts an unforgettable fish boil experience. You’ll be able to view the process on the restaurant’s patio and see exactly how the master boiler creates your magnificent meal. Inside the dining room, the fish and potatoes are served with lemon, coleslaw, melted butter, and homemade bread. Be sure to leave room for a cherry pie dessert. Fish boils are held at the inn each Wednesday, Friday, Saturday, and Sunday evening from May to October and then on Friday evenings during the remainder of the year. Pelletier’s holds a remarkable fish boil every night. In addition to the traditional savory whitefish, they serve an assortment of chicken, BBQ ribs, cherry pie, and plenty of other tasty options. The first boil of the night starts at 5 p.m. and continues every half-hour until close. Make sure you reserve a spot in advance! After a day of exploring the many traditions and memorable places in Door County, head back to your luxurious room at The Ashbrooke. 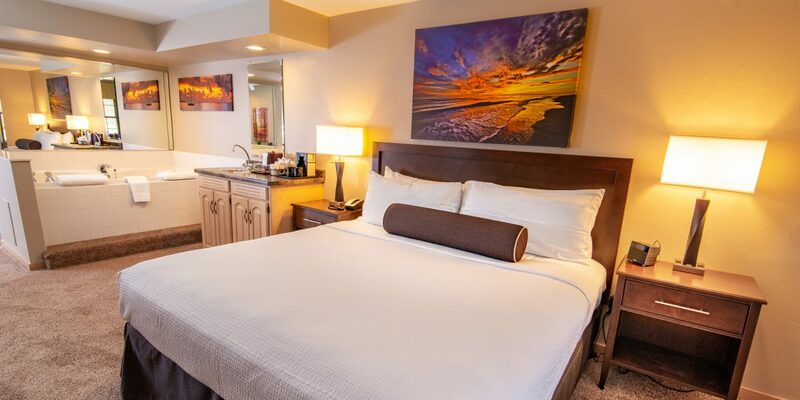 Our signature accommodations feature only the best amenities for the perfect stay. Whether you’re on a romantic retreat with your significant other or escaping the hustle and bustle of everyday life, our central location gives you access to all of the great attractions, dining, and natural beauty of Door County. Check our availability and don’t forget to request access to your free Vacation Guide to start planning your trip today!